“Shall I pick one?” I thought as the open window of the train moved slowly past a dense copse of orange trees. They were within arm’s reach, the trees buckling under the weight of the brightly coloured fruit. 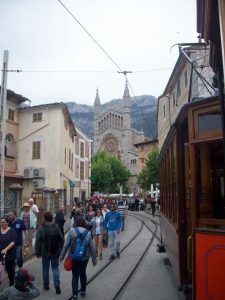 We were on the second leg of the Soller railway, a 32 km train journey from Palma, Mallorca, to the country town of Soller, which is then followed by a tram to the quiet and unassuming seaside resort of Port de Soller. The first leg takes around an hour after you’ve boarded the vintage train at Bunyola station and rattled through the back streets of Palma – past flats, shops and petrol stations – before reaching the city outskirts. 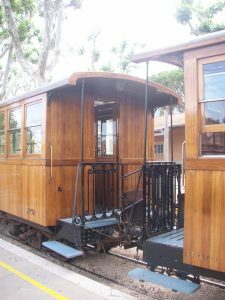 The train itself is a delight – an old fashioned wooden construction with carriages linked by wrought iron. It feels quite special and as we sat in the rickety old coach it was clear that this day out was as much about the journey as the destination. The train gathered speed a few minutes out of the city and started clanking noisily through valleys and orchards framed by dark, imposing mountains; ten minutes in, we caught sight of the orange and lemon trees we had been eagerly awaiting (we were riding the “Orange Express”, its construction in 1912 funded by the orange and lemon trade). The air becomes cooler, mountains start closing in and you pass through tunnels, emerging in to deep gorges and the first glimpse of the sea on the distant horizon. 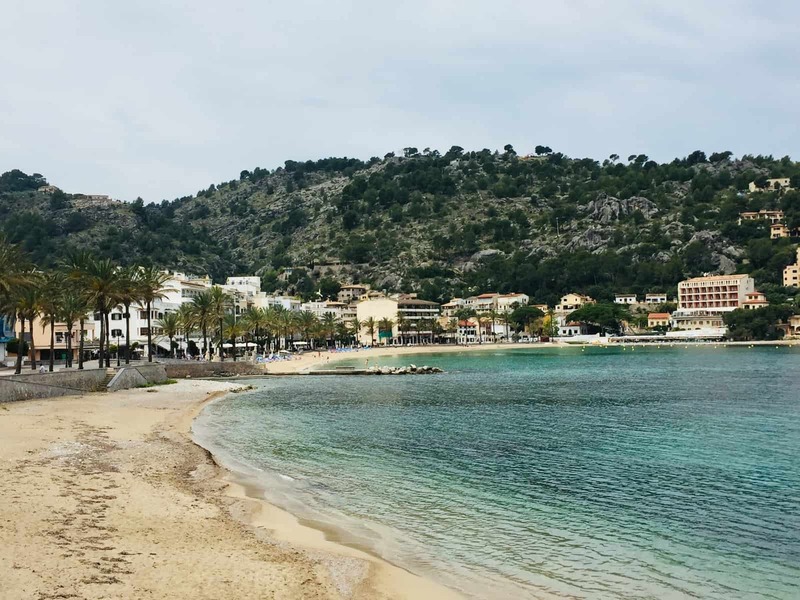 The first stage of the journey comes to an end at the small terminus, Destino Son Reus, where you need to walk a short distance to catch the connecting tram to the sea. 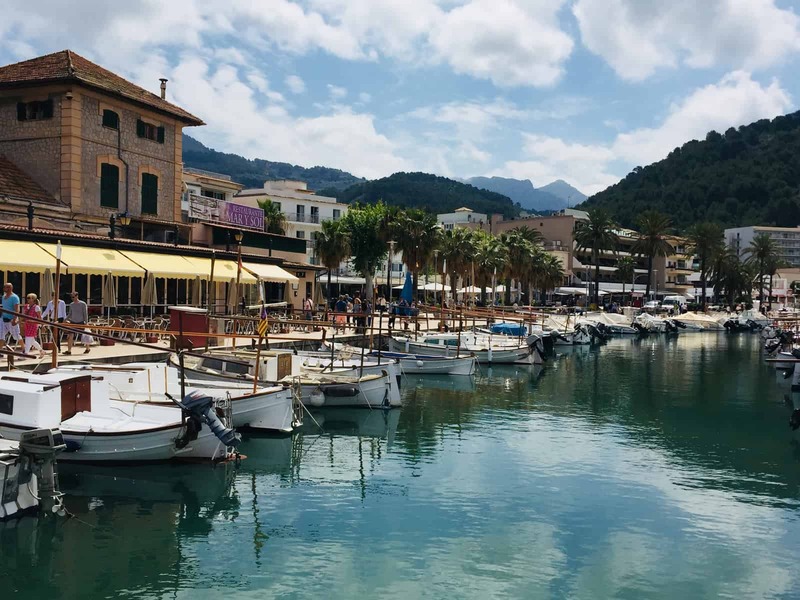 The small town of Soller is worth stopping off at and exploring if you have time: when we were there, there were market stalls and locals taking morning coffee in the sun and the town was generally buzzing with life. We also got a close-up view of the more residential parts of the town as the tram squeezed, (almost scraping walls at times it was so close), through the small back streets. It then snakes towards the coast. 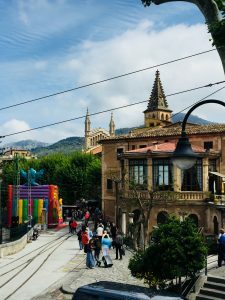 As the tram wound on we couldn’t help but notice the English St George and Turkish flags hanging from what seemed every balcony and even on surrounding hillsides, as we moved past yet more orange and lemon trees and large colourful outcrops of bougainvillea. Before you realise it, you’ve reached the sea; the tram follows the sweeping bay around to the marina and as we disembarked, we were struck by the calm and tranquillity here; the sea splashes onto the sandy beach, which was deserted when we were there, but for a few lone sunbathers and battered, redundant, pedaloes (early May when we visited is clearly just the start of the tourist season here). It was obvious that if you are looking for a party, you’re unlikely to find it here, but as we weren’t, we decided we loved this place and mentally noted it for a future getaway. 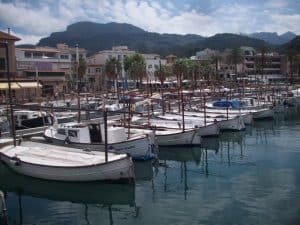 A stroll around the marina is also a great way to stretch your legs after your journey. The bay has a fair few cafes, bars and restaurants to choose from, as well as souvenir shops to peruse. 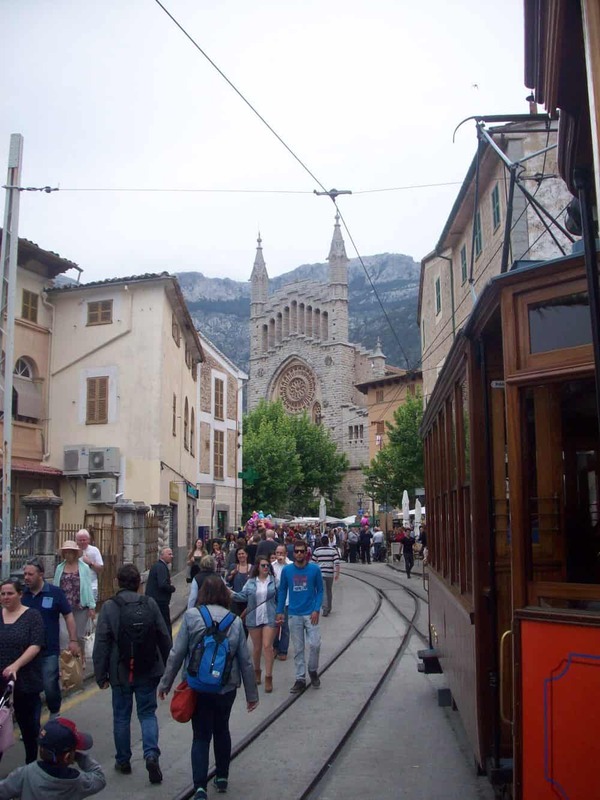 If you’re only here on a day trip, there’s definitely enough to do to fill the time you have before boarding the tram back towards Palma. We chose to while away our time sitting overlooking the water in one of the lovely seafood restaurants. This gave us the opportunity to try to find out why the area was sporting all of those English and Turkish flags and so over lunch we quizzed our waitress. “Ah”, she said “you need to stay tonight, and then you will find out”. It turned out we had timed our trip with the annual festival of “Fira and Firo”, a celebration of the 1561 Christian victory over the invading Moors – there was apparently going to be parades, fireworks and partying into the early hours. 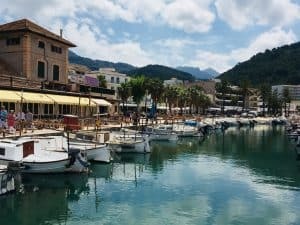 So we were wrong about Soller and parties. The residents celebrate in style and we were sorry to miss it: we had to dash for our return train back to Palma. Maybe next year. Palma’s old town is a fascinating place to wander, with a whole host of lively areas sporting fantastic bars and restaurants. 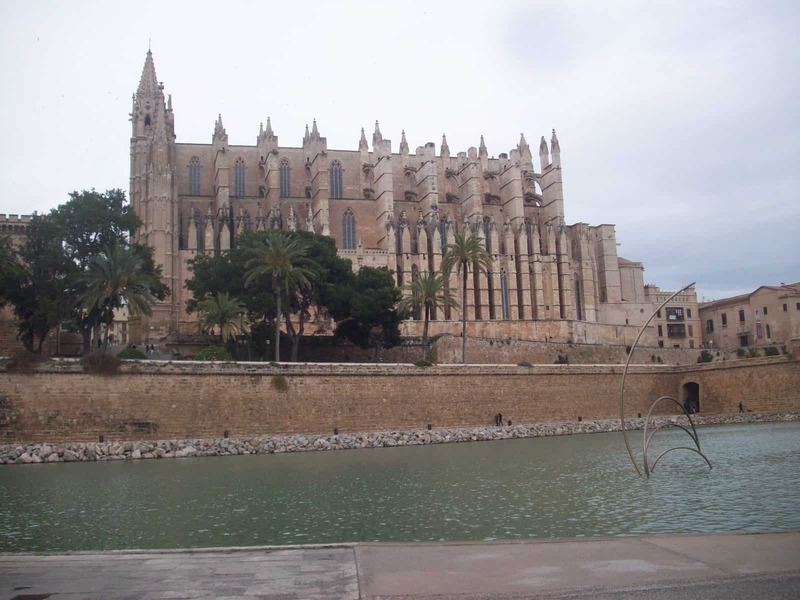 The gothic style Cathedral of Santa Maria of Palma – La Seu – is stunning and can’t be missed (partly because of its sheer size). There is also a marina and miles of promenade where you can walk along the seafront. There are times when you want to see lots of sights in a short space of time, and so opting for one of the ubiquitous hop on/ hop off bus tours is a sensible choice. 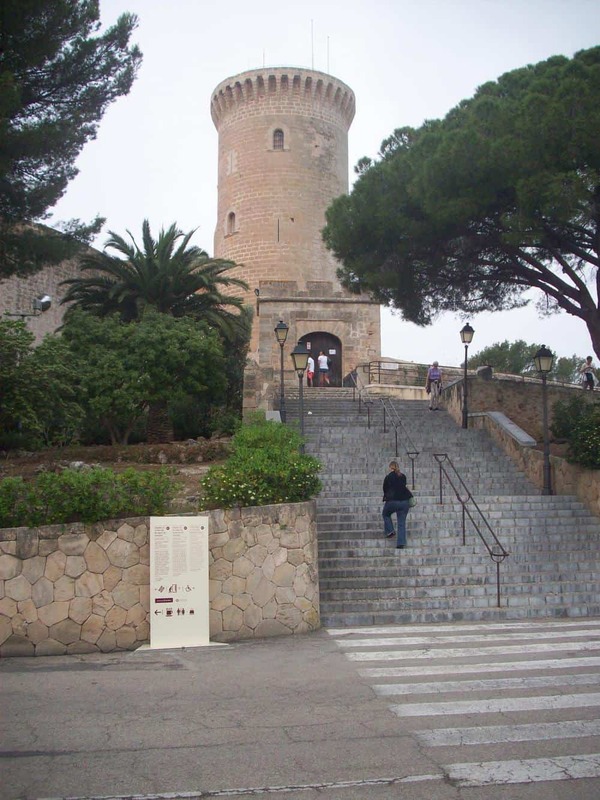 This was one of those times as we wanted to visit Castel de Bellver, which is situated 3 km from the city centre. This is definitely worth exploring, perched high on a hill with a long fascinating history that includes being a royal palace and a military prison. 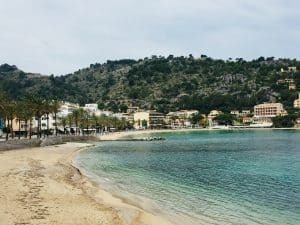 Getting there: Flights to Palma from European countries (and from mainland Spain) are not in short supply and can be bought for reasonable prices depending on the time of year you travel. The airport is close to the city centre – just a few kilometres – so is an easy hop into the centre. The number 1 bus goes to and from the airport and costs 3 euros. Thanks for this great post. Brings back memories of a spectacular train journey through the mountains to the coast. You are correct – you can almost reach out and pick the fruit off the trees. We took our granddaughter on the train. She is familiar with public transport because she uses it in San Francisco. But Paris was fascinated with this train. Now she talks about taking other train rides in foreign places.